Data networks are telecommunications networks that are installed and operated for information exchange between data communication devices such as computers and voice gateways. Although data networks can transfer any type of digital media (voice, data or video), the type of network, services used and optional configurations can dramatically affect the performance of data services. This book explains the fundamentals and how to ensure the quality of Data Network Services. It is now possible for companies to get Business Ethernet services direct to their office or homes. You will learn about the key data network parts including hubs, routers, bridges and gateways. You will discover the differences between personal area networks (PANs), premises distribution networks (PDNs), local area networks (LANs), metropolitan area networks (MANs), and wide area networks (WANs). The basic operation of Ethernet is provided along with how Ethernet has evolved and the different types of Ethernet systems that are available today. Discover how data networks are configured and managed using simple network management protocol (SNMP). Learn the basic operation of gateways and firewalls and how firewalls operate to protect networks from the unwanted transmission of information. �	Descriptions of hubs, routers, bridges and gateways. This figure shows the operational function of carrier sensing multiple access with collision detection (CSMA/CD). CSMA/CD is a carrier sense multiple access transmission scheme in which transmission collisions are followed the transmitting stations backing off the network a random amount of time before attempting to retransmit. CSMA/CD is used as the basis of Ethernet networks. This figure shows a how a router can dynamically forward packets toward their destination. 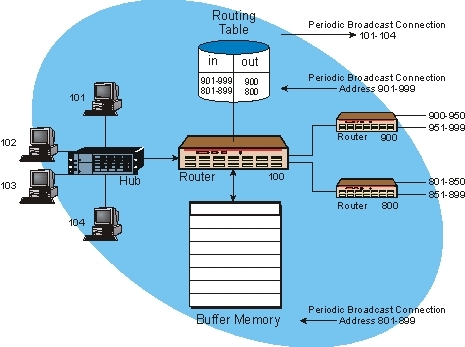 This diagram shows that a router contains a routing table (database) that dynamically changes. This diagram shows a router with address 100 is connected to two other routers with addresses 800 and 900. Each of these routers periodically exchanges information allowing them to build routing tables that allow them to forward packets they receive. 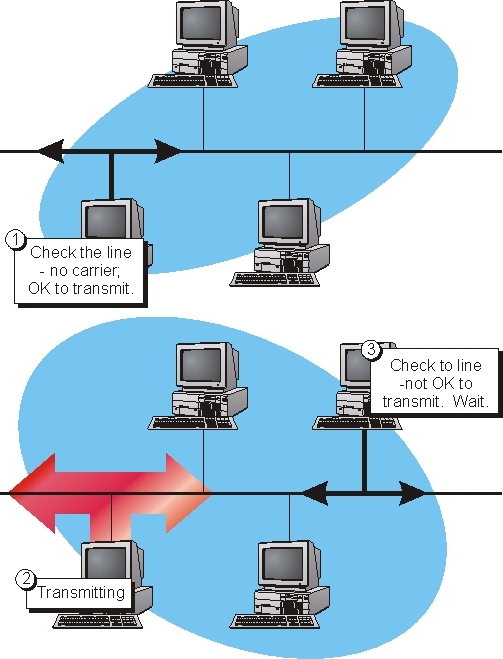 This diagram shows that when router 100 receives a packet for a device number 952, it will forward the packet to router 900. Router 900 will then receive that packet and forward it on to another router that will help that packet reach its destination. This figure shows how a firewall works. This diagram shows that a user with address 201 is communicating through a firewall with address 301 to an external computer that is connected to the Internet with address 401. When user 201 sends a packet to the Internet requesting a communications session with computer 401, the packet first passes through the firewall and the firewall notes that computer 201 has requested a communication session, what the port number is, and sequence number of the packet. When packets are received back from computer 401, they are actually addressed to the firewall 301. Firewall 301 analyzes the address and other information in the data packet and determines that it is an expected response to the session computer 201 has initiated. Other packets that are received by the firewall that do not contain the correct session and sequence number will be rejected. Mr. Harte is the president of Althos, an expert information provider which researches, trains, and publishes on technology and business industries. He has over 29 years of technology analysis, development, implementation, and business management experience. Mr. Harte has worked for leading companies including Ericsson/General Electric, Audiovox/Toshiba and Westinghouse and has consulted for hundreds of other companies. Mr. Harte continually researches, analyzes, and tests new communication technologies, applications, and services. He has authored over 60 books on telecommunications technologies and business systems covering topics such as mobile telephone systems, data communications, voice over data networks, broadband, prepaid services, billing systems, sales, and Internet marketing. Mr. Harte holds many degrees and certificates including an Executive MBA from Wake Forest University (1995) and a BSET from the University of the State of New York, (1990).